A fascinating book about maths and its role in our lives. Covers a wide range of maths topics, including algebra, geometry, charts and statistics. Colourful drawings bring the numbers to life so that even simultaneous equations start to make sense. The book is packed with information which helps understanding of all aspects of maths, with plenty of tips to help with questions. The explanations are clear and understandable and the book is presented in such a way that it makes a very interesting read. 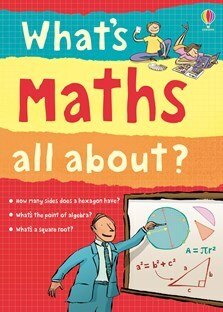 The humorous illustrations and speech bubbles enliven the book and go to show that maths is not boring.